There are no plans to put the extensive back catalogue of the Beatles on the internet, BBC News Online has learned. Hundreds of thousands of songs can now be bought online from legitimate, paid-for services, such as iTunes, but the Beatles are a glaring omission. However, almost every Beatles song can be downloaded free from sites which have been accused of promoting piracy. 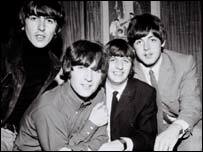 A spokeswoman for publishers EMI told BBC News Online: "The Beatles have chosen not to put their music online." "I do not know their reasoning." The decision has been taken by the band's record label Apple Corps, which is owned by Sir Paul McCartney, Ringo Starr and the estate of George Harrison. The lack of Beatles' music on paid-for sites will be a blow to the music industry which is trying to promote its own legitimate services and recover from falling CD sales. But the EMI spokeswoman added: "It is the prerogative of the artists." Geoff Baker, a spokesman for Apple Corps, told BBC News Online: "We have no plans at the moment to go online." When asked why the former band members were not putting the group's music online, he added: "I do not think there is any reason for it at all." Apple Corps is currently involved in a legal battle with Apple computers after the tech giant launched its iTunes music service. The row dates back to an agreement between the companies in which, according to Apple Corps, Apple computers agreed not to enter in to the music business. The Beatles have been traditionally slow to adopt new music formats and were one of the last big-name artists to put their music on to compact discs. EMI Music would not be drawn on whether or not they were disappointed about the former Beatles' decision. "We have got a massive roster of music online and it is our policy to have music on as many formats as the public demands," said its spokeswoman. Mr Baker said Apple Corps was unaware of any particular demand for the band's music to go online and was unconcerned by the numbers of Beatles' tracks being downloaded by so-called pirates for free. "As far as I am concerned we are doing very well as it is." He said neither of the band members have expressed any interest in online music. "I have never heard Paul McCartney talking about it," he said. The Rolling Stones were also slow to make their back catalogue available online - with the first tracks not accessible until August 2003. While many music sites boost between 200,000 and 500,000 songs they are by no means complete. But most major artists have now committed their songs to online music sites.